Practice your speed and accuracy or challenge a friend with the Titan Dueling Tree! The Titan Dueling Tree comes with 6 reactive targets that swing from one side to the other when hit. The AR500 targets make a loud "GONG" sound to confirm every solid hit. The base comes with 4 legs and is free standing allowing you to use this tree on any surface. - Set Includes: Base with 4 legs, tree upright to hold targets, and 6 AR500 steel swing paddles. - Positions: 90 degrees vertical and 70 degrees leaning. - Loud "GONG" sound provides positive feedback when a target is hit. - Last for years | AR500 steel deflects rounds and resists pitting. - Upright Height: Vertical 62.25" | Angled 58.25"
- Never shoot steel core, steel jacket, solid copper ammo, or magnum rounds at the Titan shooting target. - Do not shoot the Titan shooting target with BB's, pellets, or air soft. They do not have enough force to splatter and will ricochet. - Do not shoot any closer than 100 yards with a rifle and 10 yards with a handgun. - Do not shoot a caliber larger than .308 at the Titan shooting target. - ALWAYS wear eye and ear protection while shooting at the target. 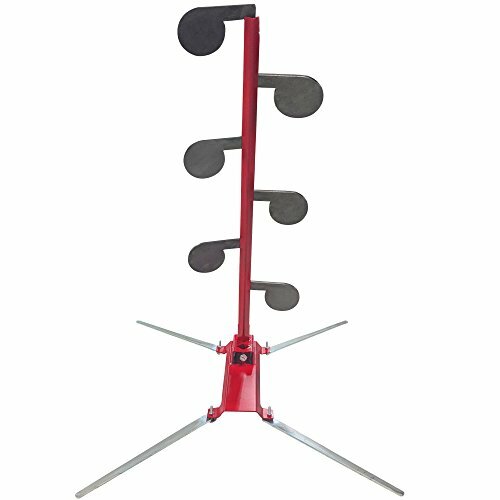 Set Includes: Base with 4 legs, tree upright to hold targets, and 6 AR500 steel swing paddles. Positions: 90 degrees vertical and 70 degrees leaning. Loud "GONG" sound provides positive feedback when a target is hit. Last for years | AR500 steel deflects rounds and resists pitting. Target Material: 3/8" AR500 Steel | Target Diameter: 6"